After winning the Academy Award for “Best Adapted Screenplay,” Graham Moore delivered what’s being called one of the most powerful acceptance speeches of the evening. After winning the Academy Award for “Best Adapted Screenplay,” Graham Moore delivered what’s being called one of the most powerful acceptance speeches of the evening. And though his words weren’t politically charged, the 33-year-old screenwriter has a very political past and a strong connection to Washington. You may recall that Moore is the son of Susan Sher, former chief of staff to First Lady Michelle Obama. 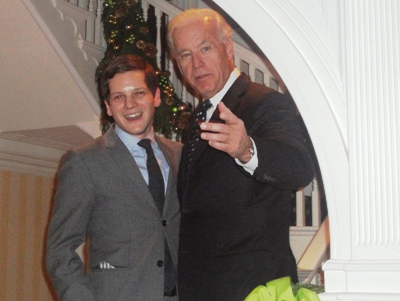 Flashback to 2010: FishbowlDC covered the aspiring author’s book parties – the first at the home of Vice President Joe Biden and Dr. Jill Biden. The power-packed party was attended by the likes of Justice Sonia Sotomayor, Alan Greenspan, Valerie Jarrett, and a slew of media, including the late Christopher Hitchens. Congrats to Moore. You’ve come a long way since “The Sherlockian.” Check out FBDC’s flahback post here.